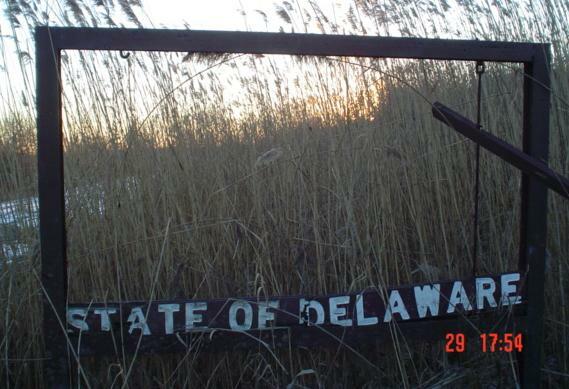 This is the land border between Delaware and New Jersey. No, seriously. I was in the Geography Bee! I know what I'm talking about! See, Lord De La War's land grant extended to the eastern high-tide shore of the Delaware River, which meant that even in the 1600's, low tide would let you walk from New Jersey to Delaware. Since then, the shoreline has changed, but the border remains as defined by age-old surveys, so that even at high tide some land on the "New Jersey side" remains in Delaware. Decades ago, one of those states decided to put up this sign at the border near Fort Mott and the Harrisonville Lighthouse, accessible off back roads from NJ 49. At some point, New Jersey decided to put a number of heavy pipe sections in front of any dirt/sand trails that led to its southern neighbor's land, probably because some unruly teenagers or minor felons found some advantage in Delaware's laws. In fact, for that very reason, a deep chain-link fence has recently been put up, along with an "At your own risk" sign - thanks to Jim Dietrich for the update. To the south, the river does that strange rerouting thing again, but that one's a lot harder to get to and a lot smaller. Try my new numbering scheme!